There is quite a brouhaha regarding VBS2 Lite US Army. After the initial news about this simulation being available to civilians, some fans have indicated that the EULA contains very explicit language stating the contrary. Regarding the VBS2 US Army Lite EULA: There was a question about the EULA and the fact that eveyone was told that there are no distribution restrictions and anyone can have a copy. A question was posted about the conflict between the statement and the EULA at the official and restricted BCKS MilGaming Community of Practice on 9 Mar 2010. "Greetings from the VBS2 Program Manager (PM): We are in the process of changing the verbiage on the license agreement to reflect the actual ULA for VBS2 Lite. The new license agreement enables the Government to provide VBS2 Lite to anyone. 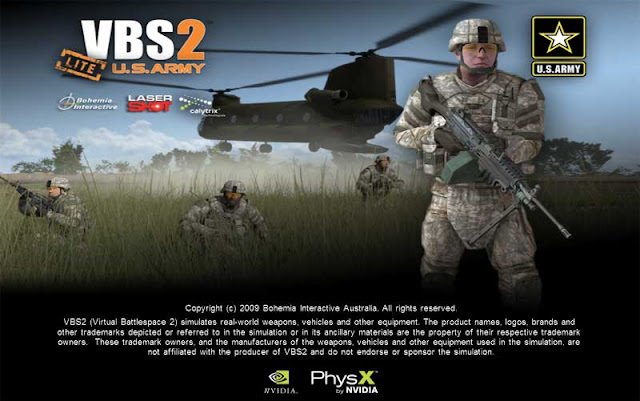 VBS2 Lite is limited in that there is no SDK, it has no real time editor or AAR capability and players are limited to 12 or fewer linked in a game. We will post the new ULA as soon as we receive it from the vendor. For now we have multiple verbal and email confirmations of the agreement from the developer."